Swimming is a healthy activity that you can continue throughout your life. This is a low impact form of exercise that is accessible to people of all ages. • It provides unparalleled cardiovascular conditioning, provided you practice regularly with good technique. • It builds longer, leaner muscles that complement the shorter denser muscles that develop from weight training. • It not only boots your cardiovascular capacity, it also gives your body a break from higher impact activities such as running and weight lifting. 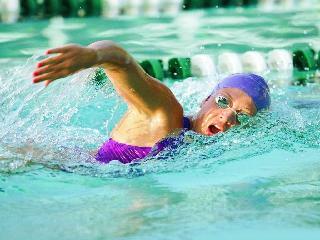 • Swimming increases flexibility, and also helps flush out toxins, thus, preventing muscle soreness and tightness. • It helps in developing core body strength as it utilizes all the body's muscles simultaneously. • It's a great way to burn calories and revs up your metabolism. • Swimming has a feel good factor that lifts and refreshes the mind. • It generates a gentle pressure on your skin which increases circulation. • Swimming provides the chance to work out in moist air which can help in reducing exercise-induced asthma symptoms. Include it in your lifestyle and benefit from the health rewards that it brings you!